Lekhnath,2 October. Canvas Institute at Lekhnath municipality organized an interaction programme about art and life. Chief guest of this programme was Mr. Rammani Adhikari, the legal officer of the Lekhnath municipality inaugurated the programme. Principals of different schools as well as stationers of Lekhnath had been participated at that programme. 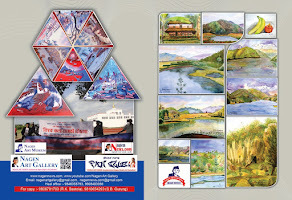 On this great occasion the note copy in which the genuine art of Mr. Nagen Singh, the assembly member of 'Nepal Academy of Fine Arts' has been printed on its cover has been disclosed. In this occasion chief guest Mr. Adhikari said that Lekhnath Municipality is the first municipality named by the name of the artist. So, municipality will give first priority for development of art and literature and also ready to help for such programmes launched by anyone said by Adhikari. On the occasion the president of Lekhnath Chamber of Commerce and Industries Mr. Laxmi Prasad Tripathi said that LCCI is ready to promote professionalism of the art and literature along with culture. So, Every year on the occasion of 'Lekhnath Mahotsav' LCCI organized different programmes which promote the art and literature.